Every log definition added to Retrospective carries some more or less important information. This information is processed by the search engine according to defined search parameters and the search results are presented to the user. The results presentation itself may be different and it’s determined by various settings defined during source configuration. Well defined configuration allows for clear data presentation but it can take some time to fine tune the splitting strategy and having to do the same for every single file added to the Retrospective wouldn’t be very convenient, would it? Of course not and that’s why Retrospective has some features which make working with log files configurations so much easier. 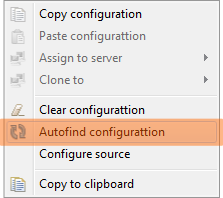 Let's start off with the Autofind configuration. This little guy determines the log entries separation, date/time formatting and in certain cases the column splitting (for log4j, Tibco Businessworks, Apache2, Apache Common Format, Apache Tomcat/JBoss, EMS/JMS, Hawk and Agorum log files) all by himself. It’s triggered automatically on newly added log definition but can be also started manually by right-clicking given log definition in the Source tab and selecting Autofind configuration from the context menu. Automatic columns splitting doesn’t work for some non conforming to standards log files. Such log files require manual configuration which can be accessed either by clicking the [Configure source...] button or right-clicking desired log definition and selecting Configure source from the context menu. The configuration itself is a simple three step wizard which can be closed at anytime by clicking the [Finish] button. Since we took our time to precisely configure the source file it would be nice to be able to have that same configuration applied to any other log definition, right? No problem. 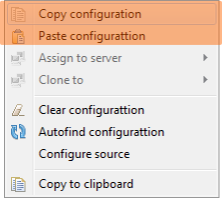 You right-click the source file that was previously configured and select Copy configuration from the context menu. Next, you right-click desired log definition and select Paste configuration to have the very same configuration applied to this source file. Wasn’t that the easiest task ever? When you right-click the source definitions you probably notice that there is also the Clear configuration option available which simply resets current configuration settings, except for the obvious log entry separation. Another option in the very same context menu is "Assign to server". This option concerns log files stored on remote hosts which have the same name and serve similar purpose (eg. when we have more than one server running the same services for load balancing or failover purpose). It allows to apply copied configuration to the particular instance of the log file stored on the selected host.